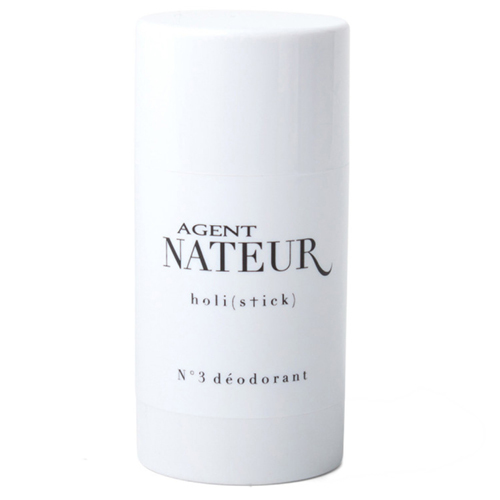 N°3 Holi(Stick) Deodorant by Agent Nateur has an ultra-smooth feel that glides on and keeps you freshly-scented all day long. Made by hand of food grade ingredients, this deodorant has never felt so good. This perfectly balanced eucalyptus and lavender scented stick is gentle enough for the most delicate under arms. Plus, the stick is perfectly sized for your beauty cabinet and travel bag. A very subtle, authentic scent that doesn't stain white tops or leave a funny powdery feel. I love this, and keep returning to purchase it. My partner uses the black one and swears it's the first deodorant that has ever worked properly. Agent Genius!